You can watch Stealing a Nation here. There are times when one tragedy tells us how a whole system works behind its democratic façade and helps us understand how much of the world is run for the benefit of the powerful and how governments often justify their actions with lies. In the late 1960s and early 1970s, the British Government of Harold Wilson expelled the entire population of the Chagos Islands, a British crown colony in the Indian Ocean, to make way for an American military base on Diego Garcia, the largest island. In high secrecy, the Americans offered a discounted Polaris nuclear submarine as payment for use of the islands. The truth of this conspiracy did not emerge for another 20 years when secret official files were unearthed at the Public Record Office, in London, by lawyers acting for the former inhabitants of the coral archipelago. Historian Mark Curtis described the enforced depopulation in Web of Deceit, his 2003 book about Britain’s post-war foreign policy. The British media all but ignored it; the Washington Post called it a ‘mass kidnapping’. I first heard of the plight of the Chagossians in 1982, during the Falklands War. Britain had sent a fleet to the aid of 2,000 Falkland Islanders at the other end of the world while another 2,000 British citizens from islands in the Indian Ocean had been expelled by British governments and hardly anyone knew. The difference was that the Falkland Islanders were white and the Chagossians were black and, crucially, the United States wanted the islands – especially Diego Garcia – as a major military base from which to command the Indian Ocean. The Chagos Islands were a natural paradise. The 1,500 islanders were self-sufficient with an abundance of natural produce, and extreme weather was rare. There were thriving villages, a school, a hospital, a church, a railway and an undisturbed way of life – until a secret 1961 Anglo-American survey of Diego Garcia led to the deportation of the entire population. The expulsions began in 1965. People were herded into the hold of a rusting ship, the women and children forced to sleep on a cargo of bird fertiliser. They were dumped in the Seychelles, where they were held in prison cells, then shipped on to Mauritius, where they were taken to a derelict housing estate with no water or electricity. Twenty-six families died here in brutal poverty, there were nine suicides; and girls were forced into prostitution to survive. I interviewed many of them. One woman recalled how she and her husband took their baby to Mauritius for medical treatment and were told they could not return. The shock was so great that her husband suffered a stroke and died. Others described how the British and Americans gassed their dogs – beloved pets to the islanders – as an intimidation to pack up and leave. Lizette Talate told me how her children had ‘died of sadness’. She herself has since died. The depopulation of the archipelago was completed within 10 years and Diego Garcia became home to one of the United States’ biggest bases, with more than 2,000 troops, two bomber runways, 30 warships, facilities for nuclear-armed submarines and a satellite spy station. Iraq and Afghanistan were bombed from the former paradise. Following 9/11, America’s perceived enemies were ‘rendered’ here and there is evidence they were tortured. All the while, the Chagos remained a British possession and its people a British responsibility. After demonstrating on the streets of Mauritius in 1982, the exiled islanders were given the derisory compensation of less than £3,000 each by the British government. When declassified British Foreign Office files were discovered, the full sordid story was laid bare. One file was headed, ‘Maintaining the Fiction’ and instructed British officials to lie that the islanders were itinerant workers, not a stable indigenous population. Secretly, British officials recognised they were open to ‘charges of dishonesty’ because they were planning to ‘cook the books’ – lie. In 2000, the High Court in London ruled the expulsions illegal. In response, the Labour government of Tony Blair invoked the Royal Prerogative, an archaic power invested in the Queen’s ‘Privy Council’ that allows the government to bypass Parliament and the courts. In this way, the government hoped, the islanders could be prevented from ever returning home. The High Court again ruled that the Chagossians were entitled to return and in 2008, the Foreign Office appealed to the Supreme Court. Although based on no new evidence, the appeal was successful. I was in Parliament – where the highest court then sat in the House of Lords – on the day of the judgement. I have never seen such shame-faced judges in what was clearly a political decision. Now the International Court of Justice has decided that the British government of the day had no right in law to separate the Chagos Islands from Mauritius when it granted Mauritius independence. The Court, whose powers are advisory, has said Britain must end its authority over the islands. By extension, that almost certainly makes the US base illegal. Of course, the indefatigable campaign of the Chagossians and their supporters will not stop there: not until the first islander goes home. 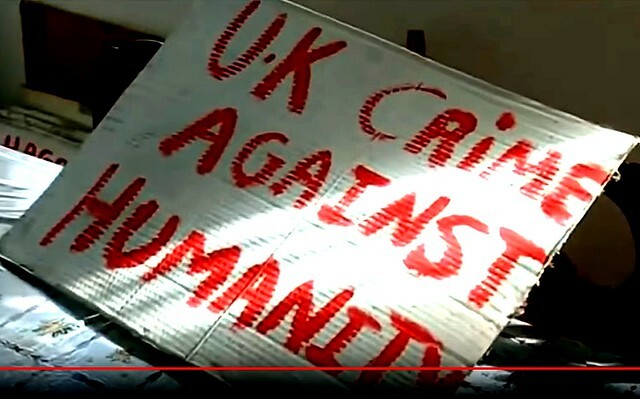 This entry was posted in England-UK-Britain, Human Rights, Imperialism, Politics, Torture, War Crimes and tagged Chagos, Colonialism, Diego Garcia, John Pilger, Military Bases. Bookmark the permalink.